In YC 116, Mordu’s Legion intelligence reported to command that the Guristas pirates were developing new and advanced strike craft capabilities using unknown technologies. In response to these reports, Mordu’s Legion accelerated a program of ship development that was itself a response to trends in capsuleer tactics and warfare. The crash development and manufacturing effort resulted in a new family of fast strike ships integrated with one another to provide tactical flexibility and firepower across ship class lines. The Garmur takes up the small craft spot in the Legion’s new strike formations and represents a fast-moving attack frigate with superior missile delivery capabilities. The Garmur is the Mordu's Legion frigate added in the Kronos expansion. It is high speed dedicated missile ship, with a large bonus to warp disruptor and scrambler range, making it an excellent kiting ship. Its modifiers to missile velocity and flight time combine to give it 50% more missile range. This means it can quite effectively "rocket kite" by firing precision rockets up to 20km, as well as a more conventional light missile kiting strategy. The high speed and warp disruptor range bonus on the Garmur make it a good skirmish scout and initial tackler in fleets, competing with interceptors for the job. The main downside is of course the extra expense, given the role doesn't have a very high life expectancy, and it is also missing the significant MWD signature bonus that interceptors get. Further information about additional or recommended skills to pilot the Garmur for a specific or it's common role(s) can be written here. That's a rare case when you should bling frigate. The Garmur can easily solo some cruisers, such as the Thorax and Vexor. Its long point/scram range (to at least 36km) allows it to sit in a gate camp and tackle the cruiser when it decloaks. The microwarp drive allows it to sit well outside the cruiser's optimal range, speed-tank most weapons used against it and easily outrun medium and heavy drones. In addition, the cruiser can't outrun the Garmur to break the point/scram. 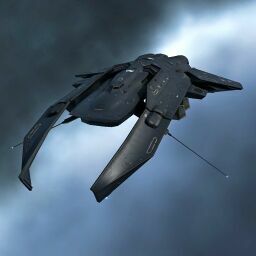 Depending on skills and the number of drones deployed, if the cruiser uses webbing drones, the Garmur's top speed may drop to just below the microwarp speed of a cruiser. In a solo engagement, this would be a momentary distraction while the Garmur pilot destroys two or more of them, which would reduce their effectiveness sufficiently to allow the Garmur to outrun (or overtake) the cruiser. You can write additional notes for Garmur here. This page was last modified on 31 March 2018, at 20:48. This page has been accessed 141,061 times.